Kannon Sama drawn for my friend Jess with the characters Go Kou. Many of my Bujinkan friends have asked me to write on the topic of this year`s theme of the Bujinkan dojo as written by Grand Master Hatsumi. First and foremost, perhaps this is better not thought of as a theme for the year, but more of a guiding principle for your martial arts and indeed life. The characters, as written, are Enlighten, Light, Protect, and Heart. Short and succinct but deep and profound as many of life`s simple things are. It reminds me of the Heart Sutra. It is said that in the heart sutra, the whole of Buddhism, it`s essence, is boiled down to a mere 260 chinese characters or 16 english sentences. In many philosophies it is said that, at first, the Master speaks but in the end falls silent and in this silence, a transmission occurs. Words become no longer necessary. In the silence, in the space between master and student, communication happens. In the course of twenty years living and training in Japan with Hatsumi Sensei, it seems that he too, at one time kicking and striking like a tiger and leaping and spinning like a dragon, he has now become more and more subtle, graceful in movement. One could say softer, smaller and even delicate, yet heavy with that which can not be weighed. At one time his poems of the gokui (極意ーinner secrets) long and flowing become more and more abbreviated, condensed. Yet this compactness and simplicity, like a zen painting, adds weight and beauty. For me, these four characters, Go Kou Go Shin, remind me of the longer poem Sensei often says before class. Chihayaburu Kami no Oshie wa toko shie ni tadashiki kokoro mi wo mamoru ran. 千早ぶる神の教えは永遠に正しき心身を守るらん. 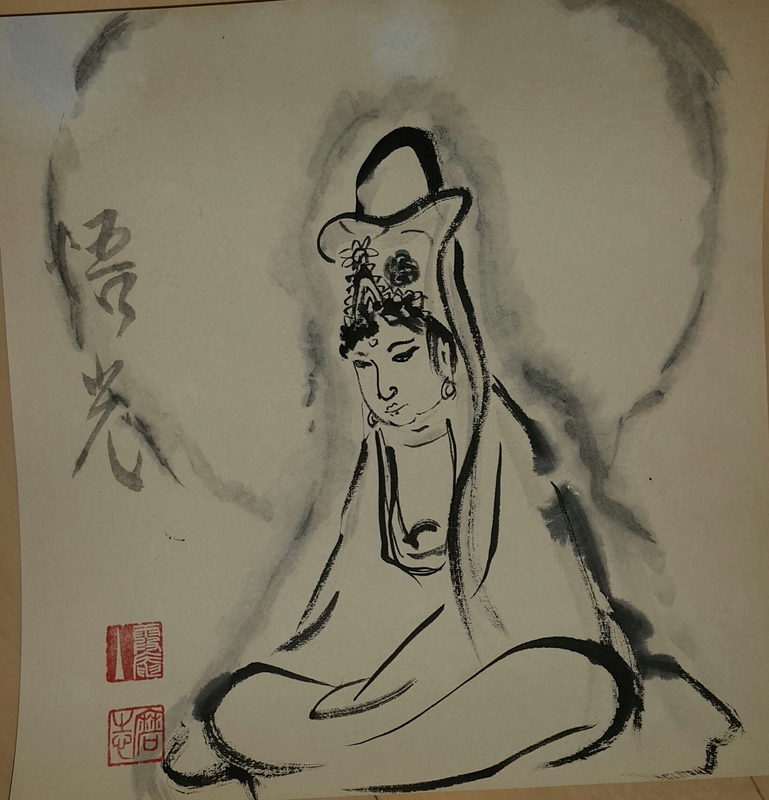 A poem which can be translated roughly as `the teachings of the divine forever protect the pure (correct) heart.` And as Takamatsu Sensei once told Hatsumi Sensei, `it is only the pure heart of man that has a connection to the divine`. Go Kou Go Shin, you understand? With age, the long poem becomes compacted, and boiled down to its essence, like a fine wine or fine whiskey takes many years in the barrel. And as Sensei approaches his 85th year, his teaching are becoming more and more elegant, seemingly simple yet heavy with experience and wisdom. And the sun asks nothing in return. It burns itself to give you life on earth. The sun never sends you a bill and the sun never negotiates prices and times with you. It never says `I gave you 24 hours of sunlight yesterday so today you work for me for 12 hours`. The sun always burns 24 hours a day for us. Without the sun, all life on the earth perishes. Without a sun, there is no life. There is also a sun in you, (hikari 光、or also pronounced kou). Uncovered and free, it too, will also create wondrous life and protect those upon which it`s rays shine. In training, at the upper levels, just as there is the Satsujin Ken and Katsujin Ken, the killing sword and sword of life, we must train on how to bring the opponent to life. The killing aspect of martial arts is easy, even children can kill trained men. Once this killing aspect is mastered, one must then turn the other way, to change directions. 180 degrees. Now you must learn how to create and support life. By losing, as Sensei says, the intention of attacking and killing, we give opportunities for our opponent to live, to maybe experience a blossoming. Moving with compassion and the heart of the gokui (inner teaching) Amo issun no tama mushi, we gently envelop the opponent to protect not only ourselves but also to protect them, even from themselves. If we move from fear and anger, we kill and stop life, But if we build an awareness in ourselves, we can move with compassion and thus truly protect life allowing the next to flower. As Sensei has said, `there is no opponent, the opponent is ourselves`. ** Perhaps you might remember when Hatsumi Sensei first went overseas, he remarked, `I am UFO, I am borderless`. To become borderless, we must continually watch ourselves and throw away the unnecessary. to see thru beliefs, to understand that we have been indoctrinated by our by our cultures, education, religions, politics, ect.. Seeing thru them, can you realize the connectedness and power of supreme nature? This entry was posted in Gokui on 03/16/2015 by Kasumi An Study Center.